Smaller than a curlew, the black-tailed godwit is a large wading bird with a very long straight bill and long legs. In spring, the head, neck and breast are a striking chestnut-red colour. In flight, it shows a white wing-stripe and a black and white tail. It has suffered a large breeding population decline in the past and is now a rare breeder. It is a summer visitor to its breeding grounds, wintering in Africa. Birds from northern Europe spend the winter on UK coasts. Much of the lowland wet grassland where godwits like to nest has disappeared from Britain and most breeding colonies are now on nature reserves where these habitats are carefully managed. Throughout Europe, godwit breeding numbers are declining because of drainage of wetlands. Up to two pairs of black-tailed godwits have nested near the estuary for several years and the nestwatch scheme has helped protect these rare breeding birds from thieves who may try to steal the eggs for their illegal collections. Black-tailed godwits are fully protected by UK law and anyone convicted of taking their eggs would face a fine of up to £5,000 for each incident or six months in prison. 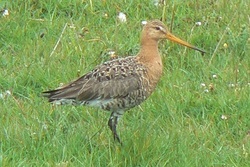 The Black-tailed Godwit has a discontinuous breeding distribution from Iceland to Siberia with three forms (distinct populations) being recognised of which two breed in Europe; the nominate form limosa and the form islandica. Islandica which, as it's name suggests breeds principally in Iceland, is currently increasing and, as it is Black-tailed Godwits of this form thatoccur in some numbers on the Ribble Estuary and elsewhere in the British Isles as non-breeding visitors, this population rise has been reflected in higher counts here. Therefore, it might seem likely that the breeding Black-tailed godwits at Newton Marsh are islandica which have chosen to remain to breed by the Ribble Estuary, indeed as many as 200 islandica regularly visit Newton Marsh to feed late into the spring. However, the nominate form limosa is the only form which regularly breeds in the British Isles, primarily on RSPB reserves in Cambridgeshire. Since Black-tailed Godwits were discovered breeding on Newton Marsh their form has remained unknown until this year when, after good views, they have been confirmed as being of the internationally declining form limosa. Limosa breeds in the Low Countries through to Russia and is a true long distance migrant wintering mainly in sub-Saharan Africa and India. 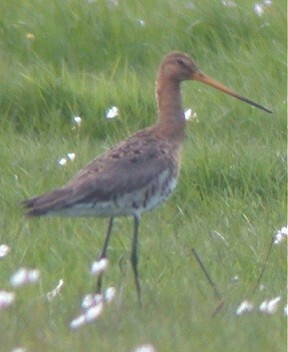 But does it really matter which form of Black-tailed Godwit breeds at Newton Marsh? 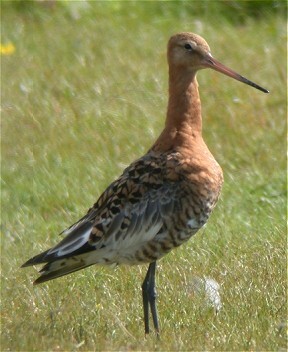 Well it may prove to be crucial factor in determining the future of breeding Black-tailed Godwits at the site. It is most unlikely that islandica will ever breed so far south and so recruitment of breeding birds from the growing wintering population on the Ribble Estuary is therefore not likely to occur. Black-tailed Godwits are long-lived birds so the same adult birds are probably returning to nest at Newton Marsh each year. If breeding success remains low in future years and breeding godwits are ultimately lost from Newton Marsh it seems unlikely that they would ever return. Telling limosa from islandica in the field is not easy but to the trained eye a combination of features often makes it possible.